← The Giant’s Shoulders #47 is up at The Medical Heritage Library! Stories of superheroes have evolved dramatically since the appearance of Superman in Action Comics #1 in 1938. Where many of the first, like Superman, were moral, upstanding individuals striving to do good in the world, many modern heroes are flawed, struggling with a sense of purpose and with their own sense of right and wrong. The supreme example of this modern style are the characters in Alan Moore’s graphic novel Watchmen (1986-1987), who are faced with a world with problems much greater than they can solve. 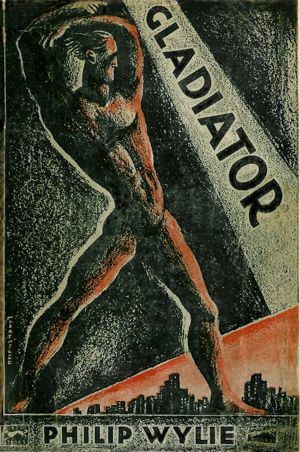 Before even Superman, however, there was a super-powered protagonist that struggled to find his place in the world: the character of Hugo Danner in Philip Wylie’s 1930 novel Gladiator. In fact, Wylie’s Danner was likely a major inspiration for Superman! Though Shuster and Siegel never admitted as much, the similarities are striking, and it is hard to imagine that the two Superman creators were unaware of the popular novel. Gladiator describes the life and exploits of Hugo Danner, a man who is gifted at birth with super strength and near invulnerability. His father, Abednego Danner, is a professor of biology at a small Colorado university and obsessed with creating a superior breed of humanity. An ant can carry objects many times its weight with ease and a grasshopper can vault remarkable distances completely out of proportion with its size; Abednego believes that similar capabilities can be given to humans. He experiments on tadpoles first, then a cat; when these efforts are successful, he surreptitiously injects his pregnant wife with his chemical formula. Hugo is born, and as a baby is so strong that he destroys his wooden crib with ease. His parents raise him to respect his powers and use them only for good purposes, and also to keep them hidden, for fear of otherwise being treated as a freak and pariah. The rest of the novel follows Hugo as he grows older, wandering through school, college, employment, and war. At each stage, his powers lead him to great success — he becomes a star football player in college, he becomes a highly-decorated soldier in World War I — but those same powers always leave him restless and isolated. He has many relationships, but can never feel truly connected to anyone due to his uniqueness. On many occasions, he attempts to use his abilities for the greater good of humanity, but finds that humanity’s problems are so vast that not even a superman can make a dent in them. In spite of Danner’s cynicism, the similarities between Gladiator and Superman are striking. Hugo Danner, like Clark Kent, is raised in a rural setting by loving parents who teach him both to use his powers for good and to hide those powers from the public. Just as Superman is known as the “man of steel”, Danner refers to himself at one point as a “man made out of iron”. Though they are rare, Danner occasionally performs acts of heroism that are very much Superman’s style. There are even more similarities, as has been noted by others. A temperamental consciouness of material force brought Hugo Danner into being. The frustration of my own muscles by things, and the alarming superiority of machinery started the notion of a man who would be invincible. I gave him a name and planned random deeds for him. I let him tear down Brooklyn Bridge and lift a locomotive. Then I began to speculate about his future and it seemed to me that a human being thus equipped would be foredoomed to vulgar fame or to a life of fruitless destruction. He would share the isolation of geniuses and with them would learn the inflexibility of man’s slow evolution. To that extent Hugo became symbolic and Gladiator a satire. The rest was adventure and perhaps more of the book derives from the unliterary excitement of imagining such a life than from a studious juxtaposition of incidents to a theme. The “life of fruitless destruction” is exemplified in Danner’s exploits in World War I as part of the French Foreign Legion. Danner is immune to all conventional weaponry, and can only be hurt by a direct impact of an artillery shell. When one of Danner’s friends is killed by such a bombardment, Hugo goes on a mindless, bloody, bare-handed rampage amongst the German forces that brings to mind another superhero, namely Marvel’s Hulk (though Danner ends up brawling naked, not with purple pants). As I said, I found Gladiator to be a difficult book to read due to its tone and structure. It is undeniably a classic, however, and worth looking into for anyone interested in the history of superheroes. Though Hugo Danner’s dark path through life did not prove to be as popular as Clark Kent/Superman’s heroic exploits, Danner has been a direct influence on the superhero genre. In Alan Moore’s Watchmen, which I mentioned at the beginning of the post, one can see a copy of Wylie’s Gladiator sitting on the bookshelf of one of the major characters! Gladiator can be read online for free at archive.org, and can also be purchased in various formats. Those interested in reading more about the novel are recommended to look at the fascinating website dedicated to it. If you want to purchase a genuine (very rare) first edition (limited to 2,500) hardback of Philip Wylie’s ‘Gladiator’, printed by Alfred A.Knopf in 1930, please contact the author’s namesake.